As we travel around Mexico in our little motorhome I have been reflecting on the diversity of architectural styles that are evident. There is much history upon which modern Mexico is laid, from the rich legacy of colonial churches to the traditions of the indigenous inhabitants that has persisted. The Mexican culture is a blend of these influences and is expressed through some obvious patterns of architectural expression. The earliest influences are the indigenous, and these have both hard and soft forms. 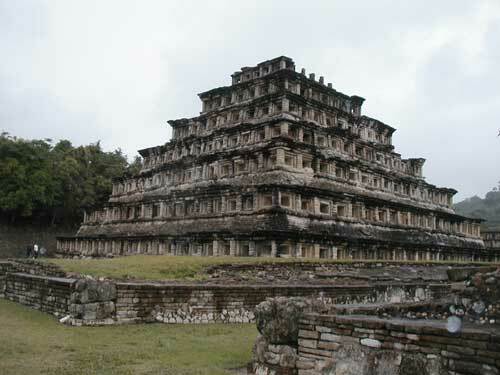 The enduring buildings from the very old days tend to be the spiritual and political centers that have been excavated, such as the pyramids at Teotihuacán, Palenque, and El Tajin. These massive projects were clearly undertaken with unified vigor and intended to remain for posterity. They were crafted from carefully shaped stones placed with symmetrical perfection. Most of these archeological sites reveal some degree of evolution or remodeling that had taken place over time, and often the older periods of work show more refined craftsmanship. 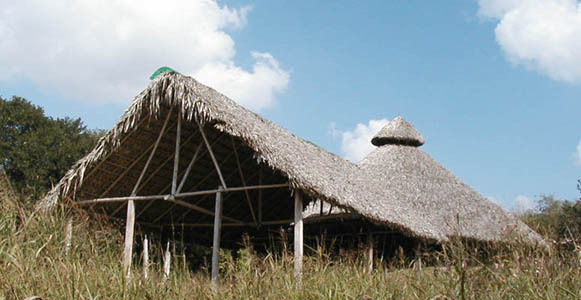 The softer indigenous architecture emerges only in style, not remnants, because the materials used were biodegradable. I am speaking of thatched roofs, wood or bamboo frames, wattle and daub walls and the like. The shapes rendered with these materials are often curvatious and flowing, such as the common beach resort palapa. These types of buildings are more often found in the back country, away from the cities, where enclaves of indigenous cultures still flourish. 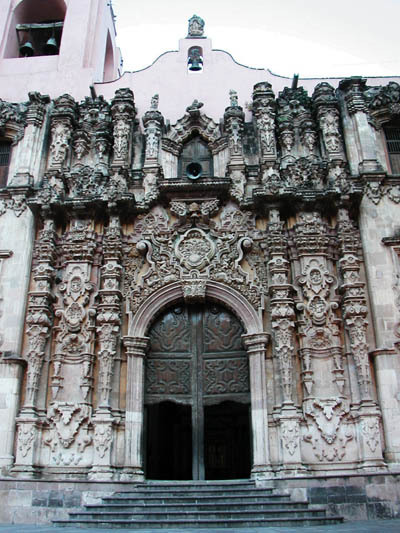 The legacy of the Spanish colonial period is very strongly expressed in cities and towns throughout Mexico. The Catholic church predominated back then, and it still does. Much devotion, wealth, and very hard labor went into manifesting glorious places of worship. The finest examples of enduring architecture from this period still exude reverence and single-mindedness. They are mostly built of carefully dressed stones, and the craftsmanship rivals that of the earliest pyramids. The more modern building in Mexico has gotten lazy. Throughout much of Mexico one can now find mixtures of all of the influences from the past. This rich blending of styles and materials is part of what makes Mexico so fascinating and enjoyable to explore. One can encounter all of these elements almost anywhere, but the trend is definitely toward simple rectangular forms made from masonry materials, especially concrete. A few years back these same shapes were hewn with adobe bricks, but this is now considered a poor substitute for the more modern cement, even if the floors may still be packed earth. 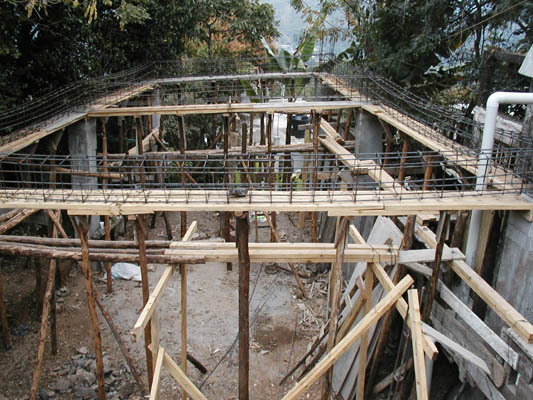 Builders in Mexico use reinforced concrete as the primary structural component for most applications. This is partly from necessity, since they do not have available the vast forests of tall straight softwoods that we in the United States have come to rely upon. The craftsmen are extremely adept at fabricating almost anything out of concrete, from foundations and floors to walls and roofs. Variations on this often employ concrete blocks, fired bricks and stones mortared within a poured concrete frame. Go to a building supply yard in Mexico, and you will find stacks of pre-formed wire mesh columns, rebar, pre-fabricated reinforced concrete I-beams, stacks of cement and lime, various sorts of roofing panels, and recently I have seen EPS foam insulation materials. I was pleased to see the insulation, because the use of solid masonry for the shell of a home, even in the relatively moderate climate of much of Mexico, leads to uncomfortable living. Too often the outside heat or cold is transmitted directly into the home and attempts to heat or air condition from within is wasted through inefficiency. 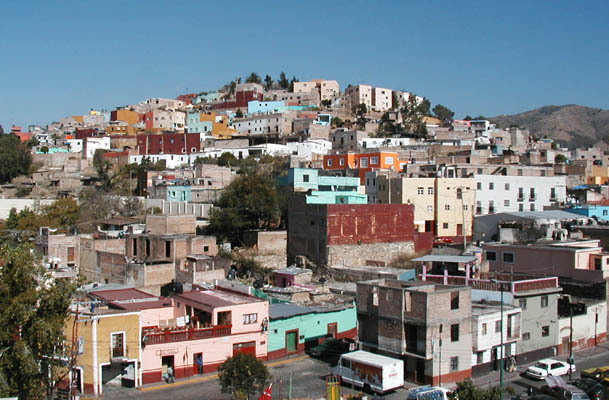 Mexico’s moderate climate is a blessing that enables them to tolerate simple, uninsulated housing. I can’t help but imagine that if they knew the benefits of good passive solar design, with the placement of thermal mass on the inside and insulation on the outside, and took advantage of earth-sheltered concepts, at least some of them would seek out this sort of housing. When looked at from the standpoint of sustainability, modern Mexico exhibits both pros and cons. The masonry materials they build with are quite durable, so longevity is an asset, and the considerable use of natural, local stone is good. On the other hand similar shapes and lifetimes could be expected from adobe, earthbag, cordwood or strawbale construction, if care were taken in the design and execution of it, and these techniques have less of an impact on the environment and can create more comfortable dwellings. you only put de picure the architecture prehispanica. I teach English in Los Cabos and will share your information with one of my students who wants to be an architect. I live in the area of Lake Chapala and we don't need heat or Air conditioning. The thermal mass of my house plus south windows and shade trees make it comfortable all year. My electric bill is about $70/month all year, and gas is about 30/month. We have TVs, freezer, swimming pool, microwave, washer/dryer, etc. I also live in the Lake Chapala area and am enjoying the same climate, one of the most benign in the world. If you read this, please go to my website, www.greenhomebuilding.com, and send me a message with how to contact you, and perhaps we can get together and compare notes! My business partner and I are migrating our business down to Guadalajara and we are looking at purchasing a fixer-uper as a 5 year plan. We are hoping for classic 18th century lving structures to start with. Any suggestions. Currently we are looking in the West side of Guadalajara but getting a tour of the areas in the next week or two. kenn- sorry no blogger account. I'm amazed by the diference of opinions based on their own experiences. I grew up in Guadalajara and I have a lot of family in Chapala and Ajijic. From my own experience by living in a concrete home and comparing it to a wood house in california there is no need of air conditioning or heating system, since the type of materials used absorb the heat during hot weather and at night time when its a little bit cold the heat comes out from the structure, this cycle is the same as having a good design for ventilation and insulation. But thank you for sharing some of the historical architecture. Modern Mexican architecture is a bit different nowdays. I appreciate your comment about the value of masonry material for building in temporate climates, and I agree that they can be more comfortable than a comparable wood-framed home. I am now living in a conventional brick home near Lake Chapala, and it is remarkably comfortable much of the year. But it still could be more comfortable, especially in the winter when the climate gets cooler. I often need to heat the space to be warm enough, and with a well-designed passive solar home in this climate I would not need to do this. I am now in the process of creating a passive solar addition to this home, and expect this to improve the comfort level noticably. 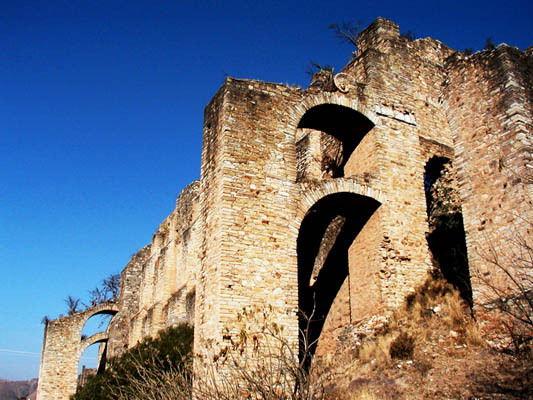 Greetings to all of you: I am an Architect here in California who studied Architecture in Morelia Michoacan, and I would like to add a few comments regarding masonry (brick-concrete) structures and thermal energy. During the day heat is absorved in large quantities and at night ast it gets cooler in some areas it vents out, so if you have a ceiling fan it helps out to vent out the heat alot faster, but it if you have a cooler it takes very little time to cool your house due to thermal properties in the masonry compared to wood, and yes it depends on the size of your house, and door & window sealings, this is very important. my email is imd1997@aol.com ADIOS amigos. Hello from San Miguel de Allende: I agree that the usual brick-and-concrete construction tends to be clammy during the winter and retain heat during the summer. New Contec blocks, made of aerated concrete are become more common. 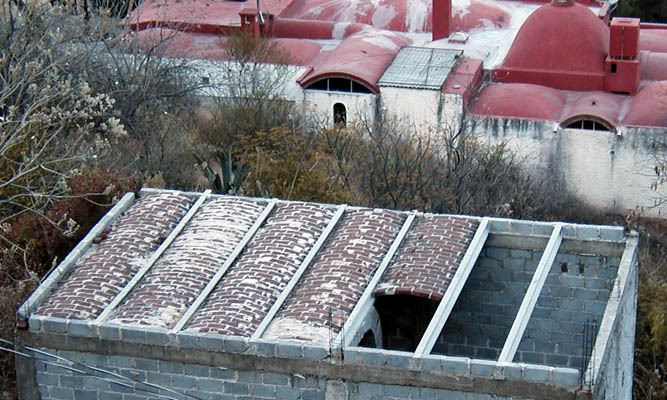 They are made in Mexico and have much higher insulation values. these are wonderful pictures. incredible references for drawing interesting architecture, as well! sorry to tell you but your blog dont show any of modern mexican arquitecture your pictures are despicable, and tipical clishe of what mexican architecture its about, Recomend you that you search better and cath up.